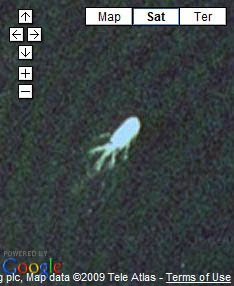 Paranormal Blog: Loch Ness Monster on Google Earth? Credible sightings of Nessie have been scarce in recent years, and I'm not sure if this latest report really counts as credible either, but here it is anyway... If you go to Google Earth and enter the coordinates Latitude 57°12'52.13"N, Longitude 4°34'14.16"W, you'll find the image below. Is it the monster? Or a boat? Or something else altogether? I'd say it was a boat. The 'tentacles' are the wake. Blunt-bowed and square-sterned boats like that are common on UK inland waters. Unless someone thinks Nessie is a giant squid, there's no way that could be it. I agree fully with Romulus... definitely a boat.